Out of the famed Lahti, Finland ski stadium and up and over the initial punchy climb, Norway’s Maiken Caspersen Falla, 40 seconds into the final of the women’s 1.4-kilometer sprint, charged ahead. In her draft, and sitting in fourth place around the hairpin that slung skiers back towards the stadium was the U.S. Ski Team’s Sophie Caldwell. Descending back past the stadium and into the next decisive hill at 1:35 into the race, Caldwell made a powerful V2 move past Falla and her teammate Tiril Udnes Weng. Falla, noting the Caldwell surge matched the pace. Atop the hill, at the course’s highpoint, Caldwell’s right side position gave her the lead as she rounded the horseshoe corner that brought skier’s descending into the main stadium. And from 2:00 minutes until 2:21 Caldwell was zooming and in charge. Sitting in her draft and sliding on Norwegian-wax-truck slick skis, Falla came around Caldwell on the outside of the long-curving lefthander into the finish straight. Falla and Caldwell sped into the final meters. Falla took the win at the line in 2:43.64 minutes. Caldwell was second (+0.11), and Sweden’s Maja Dahlqvist sprinted to third overall (+0.37). This was Caldwell’s third second place of the season. And as is the case most often when scanning race results or goggling a World Cup stream on the Internet, what we see is half the truth. Caldwell landed in Finland on Thursday after a three-week stay at her home in Vermont. In a telephone call, Caldwell said it had been six years since she had last visited her family back home during the World Cup season. She returned home to be with her mother who has been ill. While in Vermont, Caldwell trained, raced the Lake Placid SuperTour, and took time for herself and family. However, the decision was made to bring back a sense of normalcy and travel back to Europe for the World Cup. Caldwell booked a ticket. Jetted six hours ahead to Finland. She went through her warm-up yesterday testing skis. 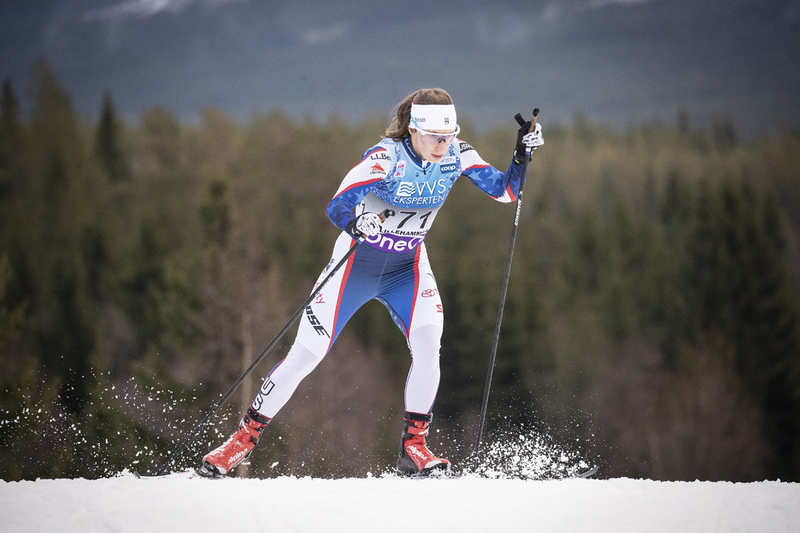 She did what she does on Saturday; she qualified third; she won her semi-final in a four-way photo finish; she skied with her Caldwell smarts to place second. No pizazz. No look-at-me social media posts. It was a steady state Sophie Caldwell on the podium. “It was really nice to be back and even though there is a lot going on in the back of my head, on race day it is nice to be out there and go through the motions that I know and still do what works well for me. And that is staying calm and staying focused and just taking things one step at a time,” reflected Caldwell when asked about her day. With Near-freezing temperatures and saturated snowpack that by all accounts was Formula One fast, the racing was tight and tactical. In her quarter and semi-final, Caldwell played coy, sitting back in the draft on the long final descent into the stadium. Those comments are in the moment reflections of an athlete in their prime. Her blinders on for 2:32.75 seconds – a blip really – and Caldwell continued perhaps the most understated run this season on the World Cup with her second place. Today, she did this all with a new rock on her finger as she and longtime partner Simi Hamilton were engaged while back in Vermont. For twenty-four-year-old Kelsey Phinney (SMS T2) Saturday was a first. She earned her career first World Cup points by placing 19th overall. Phinney’s race day began by qualifying in 27th. According to the International Ski Federation (FIS), this was Phinney’s seventh World Cup race and her first time qualifying for the heats. Last season, in March, in her first career World Cup race, also a skate sprint in Lahti, Phinney posted a 36th overall. Until today, that had been her best World Cup result. After the SuperTour in Lake Placid, Phinney joined the U.S. Ski Team sprinters in Vålådalen, Sweden where she trained for 10 days. Phinney, who has been on the national radar for several years, earned her first U.S. National’s podium this season. She placed third in the skate sprint. However, Phinney did race the early season World Cups in Ruka, Lillehammer, and Davos. That experience, according to Phinney, helped her push through into the heats on Saturday. Julia Kern (USST D-Team) came into the day in recovery mode. 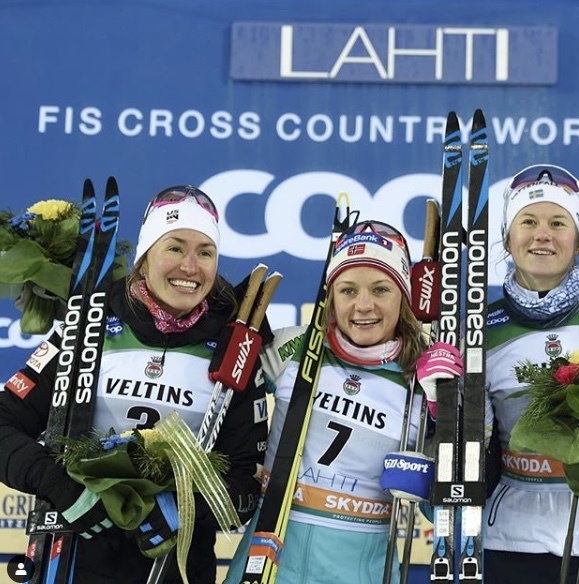 Having fallen ill during the recently concluded U23 World Championships in Lahti, Kern has lacked on-snow time and elevated heart rate exercise to tune her motor. Kern has been nominated to the 2019 U.S. Team for the upcoming World Championships in Seefeld, Austria. Kern said she is not guaranteed a start at World Championships as only four U.S. athletes will contend the individual sprint in Seefeld. Sprint results on the World Cup prior to Seefeld will help determine which athlete’s will race Seefeld’s individual sprint. Ida Sargent (USST) raced in the heats after qualifying in 26th. She was eliminated in the first heat when she placed sixth in a photo finish. Sargent ended up 30th overall. Canada’s Dahria Beatty qualified in 25th and placed 24th overall after placing fifth in her heat. Racing continues tomorrow for the men and women with a classic team sprint.